The Jazz Arts Group of Columbus (JAG) is pleased to return to the Topiary Park downtown for its second season of outdoor PBJ & Jazz concerts. PBJ & Jazz at the Topiary Park: Jazz for Kids and Families is a collaborative effort between JAG, Friends of the Topiary Park, Friends of the Library, and the Columbus Museum of Art. The next show in the series will take place on Saturday, July 10 and features Derek DiCenzo & Friends (Caribbean). Other series highlights include Yumbambe (Latin Jazz) on August 14; and the New Basics Brass Band (New Orleans) on September 11. PBJ & Jazz concerts are 1-hour long interactive concerts designed to introduce jazz and American music to young children and their families. Featuring some of Columbus’ finest musicians and ensembles, PBJ & Jazz concerts are hosted by former Columbus Music Hall owner and retired music educator Rebecca Ogden and are a great introduction to live music for the youngest audience member. 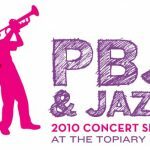 PBJ & Jazz at the Topiary Park concerts are free and follow family storytime at 11:00 AM at the Main Library. Guests are encouraged to bring a picnic and a blanket. The noon concert will conclude with a hands-on art activity, from 1:00 – 2:00 PM, presented by the Columbus Museum of Art. The Topiary Park is located at 480 E. Town Street in downtown Columbus. In the event of rain, concerts and art activities will be held inside the Main Library at 96 S. Grant Avenue. Call 614-294-5200 or visit www.jazzartsgroup.org for more information. PBJ & Jazz at the Topiary Park: Jazz for Kids and Families is presented by Friends of the Topiary Park and sponsored by the Jennifer Michel Keefer Memorial Fund at the Columbus Foundation, the Greater Columbus Arts Council, and Friends of the Library. Exclusive media support is provided by WCBE 90.5 FM. In-kind support is provided by Columbus Recreation and Parks and the Discovery District Special Improvement District.